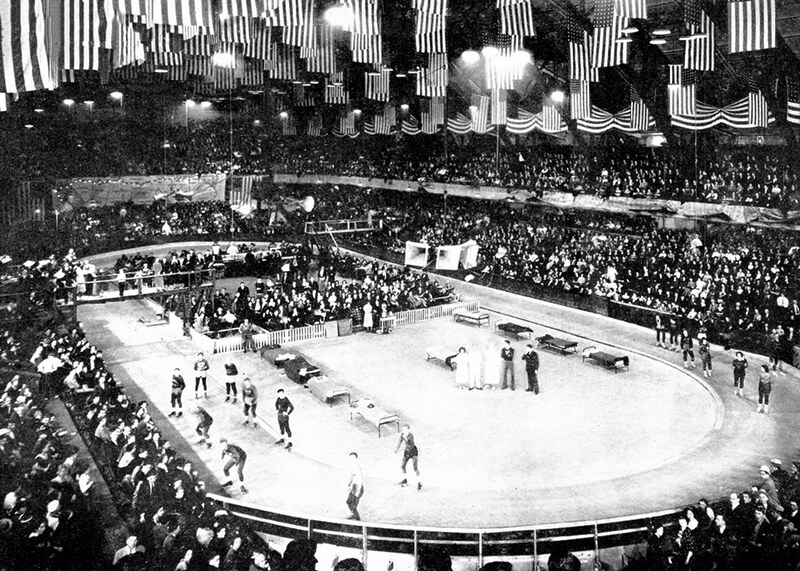 Above is the image of the very first Roller Derby, August 13, 1935. And last week was the fifth Rollercon I attended. It seems light years since the first event; but what both have in common is the intensity to compete. I hate to disappoint many of you, but if you think Rollercon is a 5 day party you have no concept of why people are there. It is amazing that athletes who are doing what they love take time from their work or lives – often at great hardship – to attend the most intensive boot camp, training school, games (some skate 3 or 4 a day! ), to better play the game that brings all 5000 of them together. Those who attend sure enjoy themselves in the other activities (including the great parties and hugging of the Commissioner), but they are there to skate, learn to skate better, and enhance their skills. The games are amazing; almost all full-bore; fully engaged as the game was intended, and getting off the track exhausted and exhilarated. Old rivalries fought at the highest level (RMRG vs Denver Dolls, for example). And often where you least expected: The over 40 game was a barn burner; coed, full speed (damn Pitchit is fast), blocking and engaging over and over (Hot Wheels is not just a glamour puss, but one hell of an athlete), and really played with the skill that age game bring. And the USARS game was an eye opener to many; closer to the original rules…..and fast, fast, fast. And yet I saw WFTDA matches where the skaters were there to play, and there was no purposeful disengagement, even on (ugh) powerjams, and the fans loved it. Just shorten the jams by at least 30 seconds, allow the pivot to do what I created the position to do (jam after a jammer breaks from the other team) and penalize the player and not the helmet, and see what a difference it would make. I really didn’t believe there were at least 1000 of you I hadn’t met, but I did break my own hugging record in just the first two days; I got to become Donna “thehotflash” first Derby wife and she my third – although she became quite jealous after the ceremony and stood between me and all others. And I did dance off, pants off, and wore my 26-year-old safari jacket to the fabulous Riedell party (one of the many great sponsors who really support Rollercon) and not only did I get great photos at the Black and Blue soiree, but some great lady gave me a standing lap dance that I will remember for quite a while. I attended as many things as I could, and Bob Noxious and I hosted a packed house seminar on marketing and building attendance…..there is so much more you can do that is free with Brown Paper Tickets and I think we demonstrated that to our group, many of whom used BPT. I think Bob got a video of the two hours, but will know later. And I want to welcome Tony Muse and the Roller Derby Skate Company to Rollercon. These skates were originally the only ones designed for Roller Derby years back, and he figured it was time to re-emerge with a wonderful new product. Check them out. They have been producing Roller, In-Line, Ice, skateboards and other products for years and have a great reputation. And guess who was the first salesman Sales Manager George Sloniger hired way back when? You betcha. And I have to thank the amazing Doug Martin, who hosted me in the Roll Models booth. He is a great guy, and his sublimated uniforms bring a professionalism to the sport that I think it needs for those who really want it to become what it should be. And Lara (Hot Wheels) is such a great representative of Crazy skates, and you will see an interview she did with me on my facebook page…..I had to learn to speak Australian to do it. I could go on and on, but can only give credit to Ivanna and Trish and Salsa Picante and the dozens of others who keep this thing going. It really is the best thing in Derby today! And the amazing crew including Sten and Michelle from Brown Paper tickets who sorted out the logistic nightmare of ticketing this event. and what great tee shirts they gave away! And I want to thank all of you who gave me even more shirts to add to my collection…..I will try to wear them all. I will be at the BPT, Roller Derby, American Red Cross Blood Drives over the next few weeks….what a wonderful project! But by God I will be back in Vegas next week, with Derby wife #4, and those who didn’t come and take advantage of at least some of the plus 400 events there were part of it, please do next year…I really want to meet you all! It was great to meet you this year and I can’t wait for next! this is from last year…..come by and see us at Brown Paper Tickets,, booth W56 by capri room 10. in for the ride of your life.